Straight Teeth in Just Six Months! The Six Month Smiles Cosmetic Braces System includes special clear braces that are used to gently straighten your teeth in an average of only six months! By focusing on the teeth that show when you smile and not making significant bite changes, Dr. Petrilli can comfortably straighten your teeth and help restore the confidence you desire! 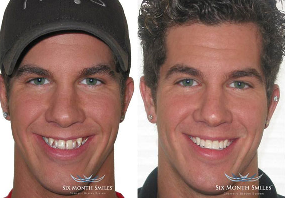 Q: How can the Six Month Smiles System straighten teeth in only six months? A: The Six Month Smiles System employs new and specific orthodontic technology that provides for safe, comfortable, and efficient tooth movement. Additionally, the aim of Six Month Smiles is to correct the teeth that you are unhappy with and not make time consuming changes to the way your back teeth bite together. Q: What do the Six Month Smiles braces look like? A: The Six Month Smiles braces and wires are barely noticeable as they blend very well with the color of your teeth. These definitely aren't metal braces! A: Six Month Smiles involves light forces to gently move your teeth to their new position. The process is comfortable. The short treatment times are not achieved by using high forces on the teeth. A: Yes, as with all orthodontic treatment, a retainer is necessary to maintain the straighter position of your teeth. If you don't want to wear a removable retainer, you can have a bonded retainer placed behind your teeth. There are a variety of options that you can choose from according to your personal preference and situation. A: There really is no catch. If you are an adult (15 years or older) with crooked or spaced teeth and you're not looking for a major alteration to your bite, this is a fantastic option for you!